There isn’t really a great proxy for illustrating to an outsider what the experience of Knicks fandom over the last decade and a half has been like. That simulated recreation of watching the Titanic sink in real time, the excruciating numbness that sets in between the initial run-in with the iceberg and the eventual splitting of bow from stern, comes to mind. Continually hammering fans with big names due, primarily and presumably, to the circumstances of your team’s geography is no way to run a franchise in 2016, yet James Dolan has spent the waking hours of his tenure doing what he thinks would appease the New York fans and media with Epimethean transactions, not so much throwing money at has-beens as chucking the GDPs of small countries into steam engines, grossly inefficient and long outdated, to watch it burn, all the while expecting to outpace air travel. For their part, as Bethlehem Shoals noted for GQ, Knicks fans are attracted to misery like a moth to a flame, ever the masochists. When surveying some of the more insane roster moves in NBA history, the Knicks appear far more often than they do on the list of champions. Penny Hardaway, Stephon Marbury, Steve Francis and, of course, Andrea Bargnani have all adorned some combination of blue, black and orange long after their best years had passed, seemingly unbeknownst to New York’s management. The mid- to late-aughts Knicks teams were more desolate and uninviting than the average New York winter. Enter Derrick Rose, the former MVP and three-time All-Star whose knees are liable to shatter if a car drives by two blocks away and whose ligaments have all the strength of stringed mozzarella. He once was Westbrook before Westbrook, a man whose exploits destroyed nascent social media while garnering accolades and league-wide respect before he could drink legally. In bits and pieces over the last two seasons, he has shown flashes of his old self, but never consistently. He is reputed as having a strong work ethic, yet he cannot seem to stay on the court for extended periods of time – there is no justice served to a man injured, I suppose. That, combined with the rise of backcourt mate Jimmy Butler as a primary two-way superstar, led to the Bulls shopping Rose as soon as the season ended. In the Knicks, always the Knicks, they found a willing suitor. Across social media, Knicks fans are greeting Rose with a mixed reaction, to say the least, the aggregate of which seems to be something like the scrunched, apprehensive countenance when seeing someone whose face you recognize but whose name doesn’t immediately come to mind. You know you know this guy, but from where, and why did you ever care? It isn’t so much the addition of an injury-prone, ball-dominant point guard – Rose is entering the final year of what will be, as of the July 1st salary cap raise, a suddenly much friendlier contract – as it is what the Knicks gave up to get Rose and how he will fit the lineup, if he’s able to play consistently enough for that to even be an issue. Robin Lopez was a respectable center who fit nicely with both Carmelo Anthony and Kristaps Porzingis, and Jerian Grant showed some promise toward the end of last season when Kurt Rambis, you know, gave him actual playing time. Neither of these is a terrible loss in itself, but, as Chris Herring at the Wall Street Journal noted, it was probably more of a haul than they had to give in order to get Rose. Hiring Jeff Hornacek seemed to be a step in the right direction for Phil Jackson, a headstrong man so seemingly focused on trigonometry that you’d think he believes the ball is a pyramid rather than a sphere. Hornacek’s offensive scheme was going to be the source of much discussion and intrigue surrounding the Knicks; the addition of Rose, and complete lack of anything beyond Anthony, Porzingis and Kyle O’Quinn pushes that particular envelope even further. As much as Jackson wants to believe it, this is not the kind of situation that will make Kevin Durant stop, mid-conversation, and daydream about the trek to Madison Square Garden in the dead of winter. 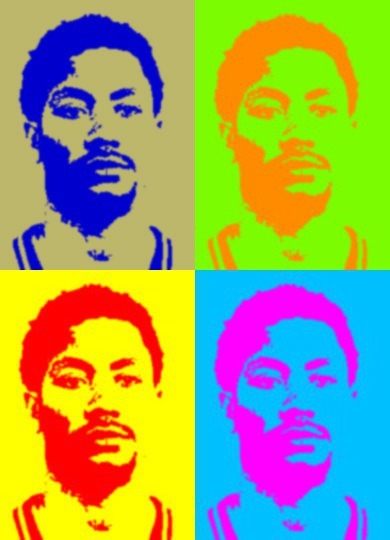 Again, it begs the question: what is Derrick Rose, and what can he still be? He’ll be 28 by the time the season starts, a full six seasons removed from his highest of highs. He was a net negative last season, and he talks openly about preserving himself for life after basketball. The best thing he has going for him under the impossibly bright lights of the New York media is that his emotional range starts somewhere around disinterested and lands at approximately detached. By nature, Phil Jackson is an inscrutable man, an 11-time NBA champion whose ring count is unimpeachable but whose social media presence and personnel decisions have left us all making various drug-related jokes. Taking on Derrick Rose is an acquisition at the exact level of confusion he seems to seek out, a high-risk, (possibly?) high-reward move that is neither win-now nor win-later. James Dolan is a well-established stargazer, perhaps the most notable in sports this side of the English Premier League. Past moves have outright failed, and his iron fist and sometimes childish impatience has drawn fan protests and led to accelerated, hopelessly unrealistic timelines. Derrick Rose is a man of broken promises and a broken body, the Bizarro LeBron who tried everything in order to deliver for his city. If his body betrays him once again, Rose’s place in the NBA becomes ever more oblique, and the Knicks’ place in the NBA becomes clearer. And yet, as every Steph Curry three from the fifth dimension proves, every shot taken has a chance to sink. An undoubtedly reliable citation from Forbes, so you don’t think I’m out here making this up. Not including Amar’e Stoudemire, whose signing in 2010 was a necessary calculated risk that essentially heralded in the post-Isiah Thomas Knicks. Also not counting the trade for Anthony, despite the fact that the team likely could have (and would have) signed him in the 2011 offseason. Obligatory Jose Calderon mention – you still an NBA record holder, B. The Knicks again have their own first round draft pick in 2017. *A previous version of this post listed Derrick Rose as a two-time All-Star; he has, in fact, been an All-Star three times in his career thus far.